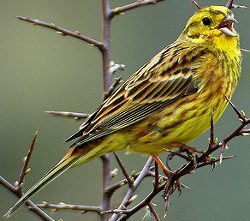 The Yellowhammer is widely distributed throughout central and Northern Europe. Numbers in the UK have fallen drastically in recent years due to changes in farming practices. Farmland and upland heaths, frequently flocking on arable farms in winter. 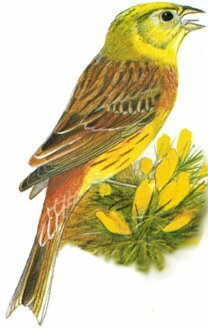 The Yellowhammer is a much loved British bird with it's well known summer call of 'A little bit of bread and no cheeeese'. Although males often miss the last bit of the call altogether asking only for a little bit of bread! The female Yellowhammer is much browner with more streaking on her yellow underside than the male. She has less yellow on her head but still retains the rufous brown rump and white outer tail feathers. Note the overall bright yellow appearance of the male yellowhammer, most often seen singing from a high perch in spring and early summer. 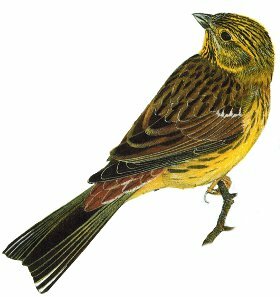 The male Yellowhammer is a bright yellow bird with a brown back, black tail and rufous brown rump. The males plumage is brightest in the spring, gradually becoming duller as the summer progresses. Note the distinctive rufous brown rump on this female Yellowhammer and the yellow colouration of her head. 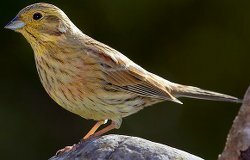 Female Yellowhammer or Female Cirl Bunting? 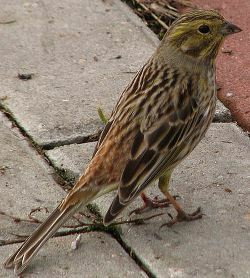 Female Cirl Bunting, note the very slight rust-brown patches on the birds breast and the birds slight build.